Gulf Coast Home Sales-Rentals: Bluewater Condo For Sale in Orange Beach, AL. Bluewater Condo For Sale in Orange Beach, AL. Bluewater condo for sale in Orange Beach AL. Incredible Gulf views from this gorgeous 12th floor 3BR/2BA direct Gulf front condo at Bluewater in Orange Beach! 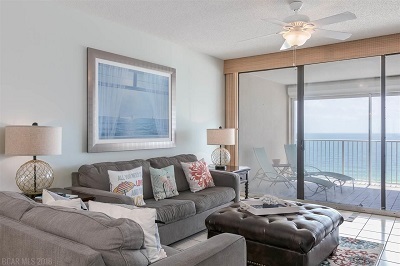 Bluewater 1205 overlooks the Gulf of Mexico, white sandy beaches of Orange Beach and the spacious Gulf front pool. Beautiful upgraded kitchen and bathrooms with granite (and steel tile backsplash in the kitchen). Tile throughout except carpet in the bedrooms. Electric storm shutters. Other on-site community features include a kiddie pool, an indoor pool/hot tub, outdoor pool, fitness room, and a BBQ area with 2 charcoal grills (1st come/1st serve usage).